Actually, I’ve had copies of Knights of the Living Dead for a couple of weeks. 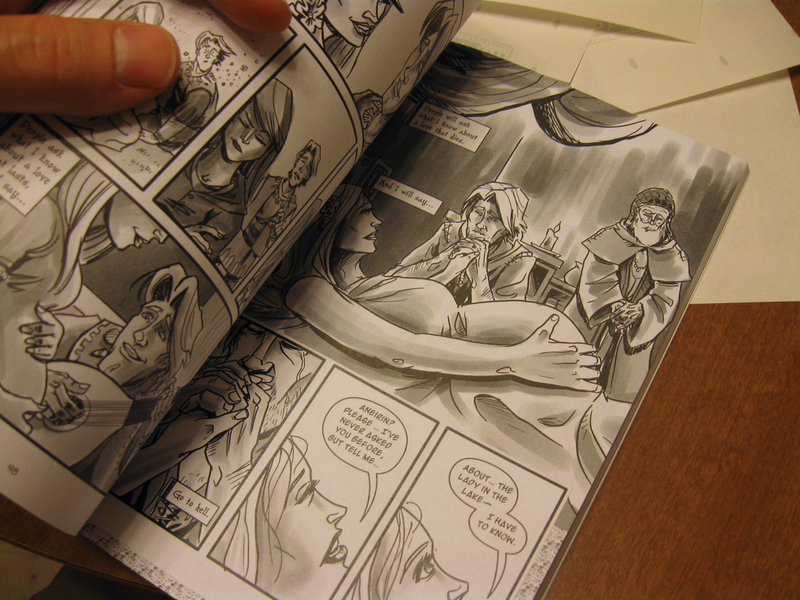 And the books look great, better than I could have hoped… except for one small issue on page 99…. So apparently when the file was transferred from my publisher to the printer, this happened to page 99. It wasn’t caught when it was proofed, so every book in the first printing has this error. Every. Single. One. And the printer wasn’t at fault so no chance of us getting a reprint. Dan Vado, the publisher at SLG, decided the best course of action would be to place an insert into the book which is honestly the only reasonable solution to the problem. But I still had 4 boxes of books sitting there, and I really want to have them for HeroesCon, which wasn’t going to happen if I waited for the insert. I decided to do something somewhat different for people buying the book from me. I decided to order some custom stickers to insert directly on the page.I liked the idea of that better than an insert. With my solution, you won’t have to worry about losing an insert. These stickers aren’t going anywhere. Trust me, I didn’t get a few lined up right and once they’re on the page, they’re stuck. Needless to say, I’ve already got a few books put aside for friends/relatives. I left a place for Ron and I to sign on our books and spent about an hour signing a ton of stickers. 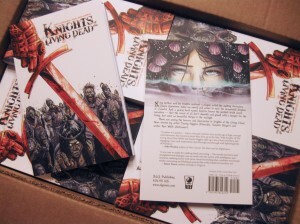 So now, about 15%, or approximately 300 of the first printing of Knights of the Living Dead will have these in them. If you like to collect rare books, I imagine this is going to be right up there. I am not doing this again. So here’s the book with the fixed sticker in it. 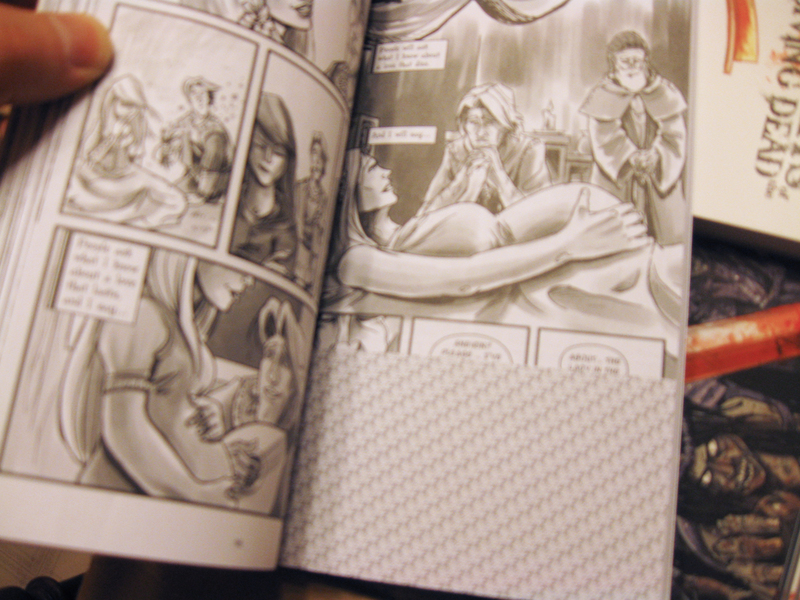 I managed to find a sticker paper that virtually matched the type of paper the book’s printed on, so it’s barely noticeable. Ideally, I would’ve loved to have had a book with no errors, but I feel given the circumstances this is a good solution for people who want to pick up the book. 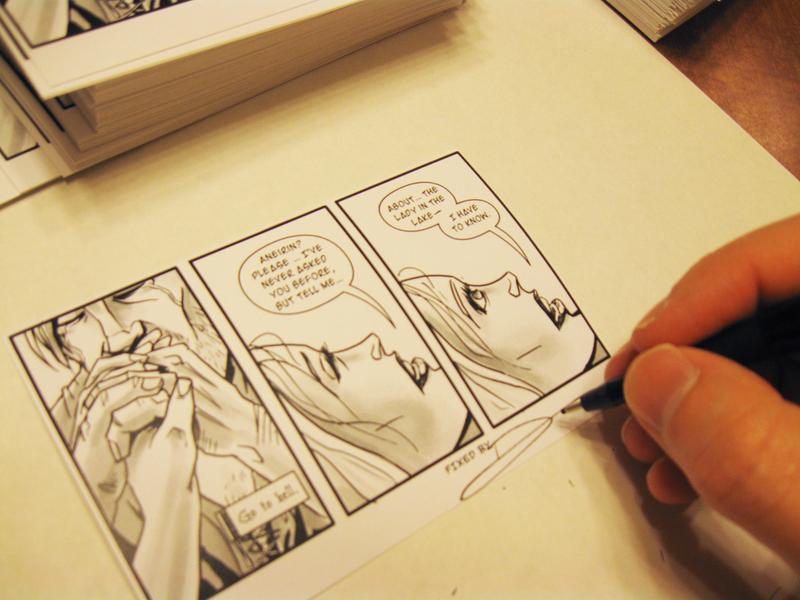 I’ll also be redrawing the missing panels in a handful of books for a little more than the cover price. These will be signed and numbered. If you’d like one of those, ask about them. So in addition to this new book that will be debuting at HeroesCon this Fri-Sun, I’ll also be signing copies of Pinocchio volumes 1 and 2 with my co-author Van (sorry, volume 3 won’t be out until July) and I’ll have prints, and Pinocchio buttons. I’ll also be doing sketches as well. Want to a picture of you as a medieval zombie? Stop on by the booth!